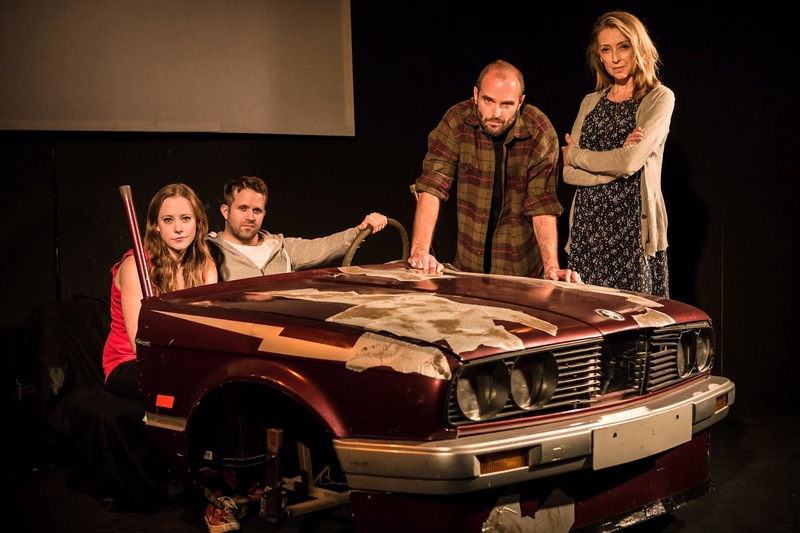 Currently running at the Kings Head Theatre in London, Savio(u)r presents the professional UK premiere of Neil LaBute’s Autobahn. Set on the highways of America, this is a series of seven vignettes, each taking place in the front seats of a car. A combination of monologues and duologues, the scenes are unrelated to each other in their narratives and characters, but where they overlap is in their structure. With each, the audience must spend a few minutes detecting what relationship the characters bear to each other and what situation we are intruding on; then as the scene plays out, we see the layers gradually unfold, and slowly realise that – in many of the scenes – the situation is not quite as clear-cut as it may initially have seemed. All seven scenes were performed by just four actors, so there was a fair amount of multi-roling. This worked very well, and I enjoyed seeing the same faces tackle vastly different characters and styles. In a play of this style – where movement is minimal and the actors are facing out to the audience for the duration of the scenes – the challenge for the actors is that there is nowhere for them to hide, as we can identify every thought-change that crosses their faces. Therefore, the performances, character development, and clarity of sub-text need to be spot-on. All of the actors rose to this challenge and the performances were truthful, engaging, and often darkly funny. Particular mention should go to Zoë Swenson-Graham who shone in each of her four very different characters. The staging was simple but effective. The front half of a car was the main focus on stage, with a large screen behind showing a film of the varying roads and views where the scenes were taking place. A soundscape during each scene added to the atmosphere. The direction was clear, taking us into the world of each scene very adeptly, and slowly giving us hints as to what the real truth was behind what the characters were saying to each other. My only minor gripe was that the character changes that took place on stage were a bit bland and slowed down the action too much. There was a lack of clarity about whether the actors were changing as themselves or as their characters, and I would have liked to have seen a clearer decision on this which could then have been made more dramatic and engaging for us to watch. Autobahn is an entertaining play that investigates the complex and often dark layers of human relationships; the lies that we tell to our loved ones, as well as to ourselves. As an observation of humanity, it appealed to my head, as I found the characters interesting and the dynamics between them engaging. However, there is a sense of isolation and hopelessness in each of the relationships – and perhaps this is the point that LaBute is trying to make – but it was this lack of warmth or heart, coupled with the structure of the play (where the audience are continually introduced to different characters and situations), which left me unattached to any of the characters in particular, and unmoved by the piece.